We save a lot more when we buy things in bulk. From toilet tissues, grains, pet foods, if you dare to do the math, buying in small quantities makes you spend a whole lot more compared to buying in large quantities. However, as you decide to buy in bulk, you will need to have enough space in the house to store them until they are used. This is where plastic containers play important role. You can either use round buckets or square buckets for containing your bulk goods. Basically for space efficiency, both round and square buckets are good to store grains and pet foods. If the things you are storing have shapes, then perhaps square buckets are better to store them. 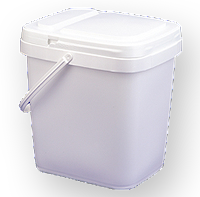 4.25 gallon square EZStor bucket comes with a lid with hinge, making it very ideal for frequent dispensing and refilling. All you need to do is to place your pet foods (for example) inside, close the lid to prevent the pet foods from dusting, and easily open the hinged lid as you want to spoon out some of it for your pet. This is also effectively applicable for rice and other types of grains. The 4.25 gallon square EZStor pail also has a handle so that it's easy to move around. It's white and FDA approved so it's safe to store food products. You can purchase these square pails with minimum order of 6 packs. By having a set of these pails, you will have great containers for your bulk household items. Your house will stay tidy and organized and you will do a great saving. Click here now to order some. Square buckets that include a sealable lid, a tongue bottom and groove top offer a very stackable surface. These food storage containers can stack well on top of each other. The square shape also provides the best in space storing dimensions. You can take full advantage of s generally square or rectangle storage room.